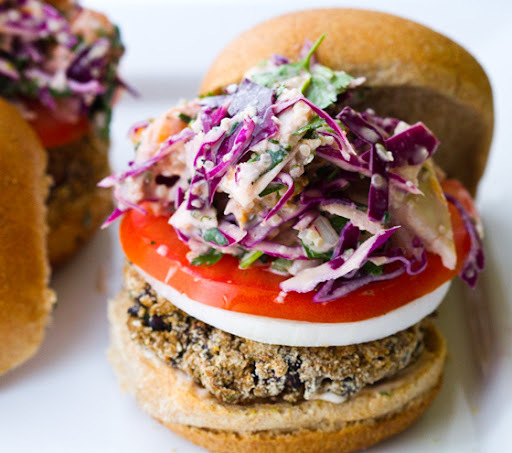 Black Bean Fiesta Veggie Burgers! 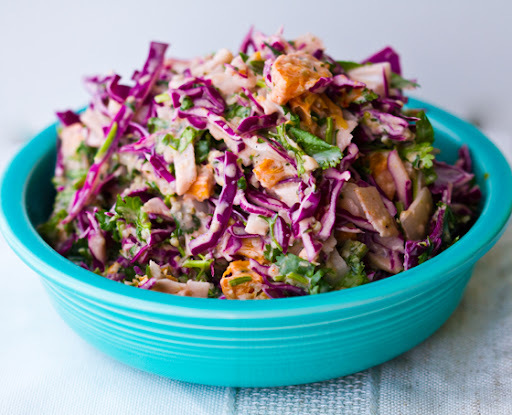 Slaw on top.. 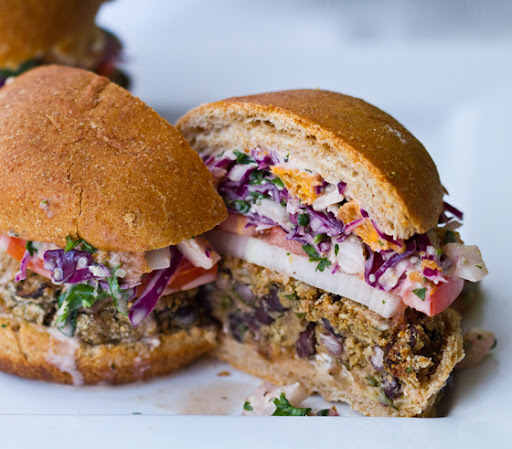 This Black Bean Fiesta Burger has a savory spicy black bean patty topped with zippy Cilantro Jicama Fiesta Slaw - a few swipes of my "special spicy sauce" on the whole wheat toasted buns - and some tomato, onion and avocado. Slice. Serve. 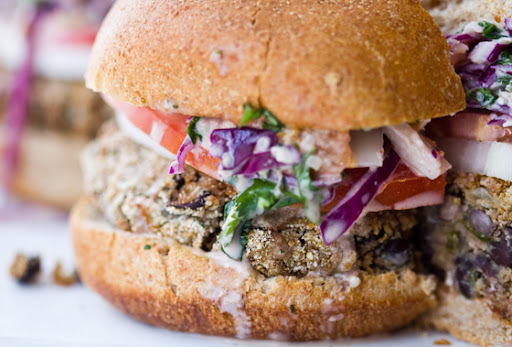 Smile to find yourself in veggie burger bliss. Sweet potato fries optional. 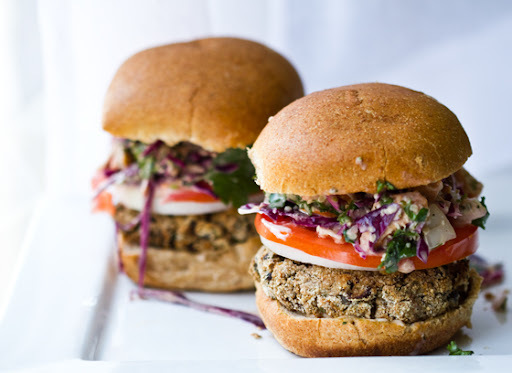 Ever since I had my quickie interview with Bobby Flay I've got veggie burger recipes on my mind. Bobby's right. 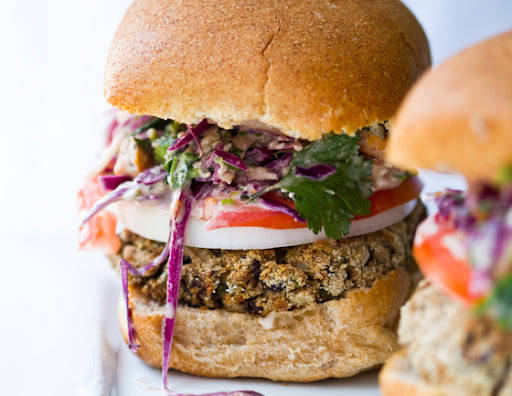 A really good veggie burger is not an easy thing! 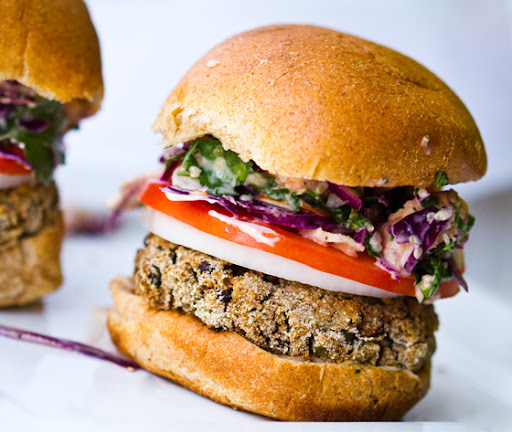 It takes the perfect texture, combo of spices and flavors, something to make it stick together - for vegans, no eggs allowed - and to me, a veggie burger still has to be healthy. 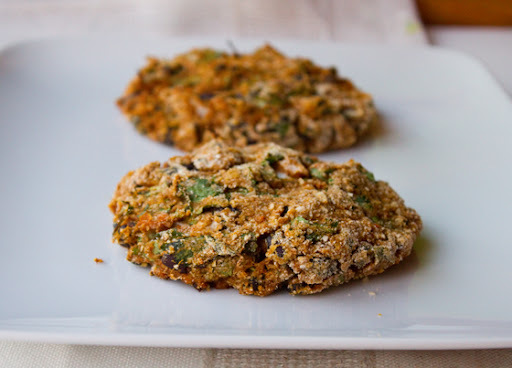 Deep frying a bean patty might be yummy, but it's missing the point. A good veggie burger is a powerful thing. Am I sounding dramatic? But it's true! 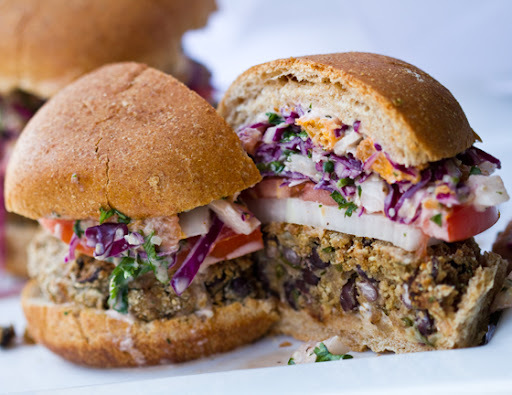 A good veggie burger can make anyone - even real-hamburger addicts - say "Wow, I really could crave this veggie burger once in a while!" - or maybe, just maybe one good veggie burger, and you might crave a veggie burger all the time..
First, let us gawk at the beauty of a Veggie. Burger. shall we?.. 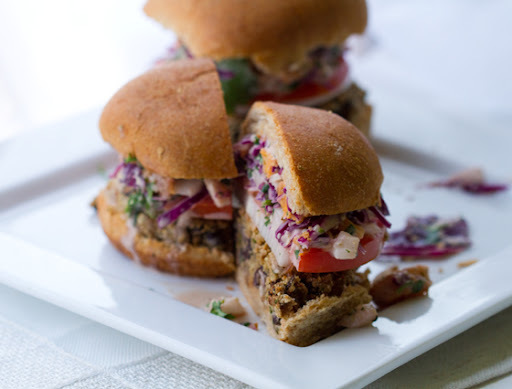 Fiesta Slaw - zippy burger topping.. I'm not saying I'm a veggie burger expert. I still have a long way to go in crafting "the perfect burger" - or maybe Bobby will do it first for me. But I'm certainly proud of the recipes I have created thus far. And today's black bean burger gets a thumbs up from my taste buds. 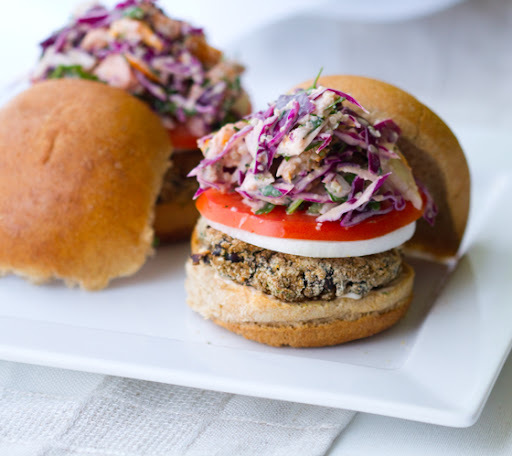 My other veggie burgers: my white bean burger, my green edamame burger and even my sweet potato burger. And my latest burger is black bean - in honor of Bobby's preference for southwestern flair. I even took Bobby's advice and included some crunchy jicama in my burger-topping slaw. Don't forget the avocado!! I did. As you can tell from the photos. I had some lime-juice spritzed, sliced avocado all ready to go for the burgers, but I forgot it! I later added it for a taste test and I definitely recommend it. 1. 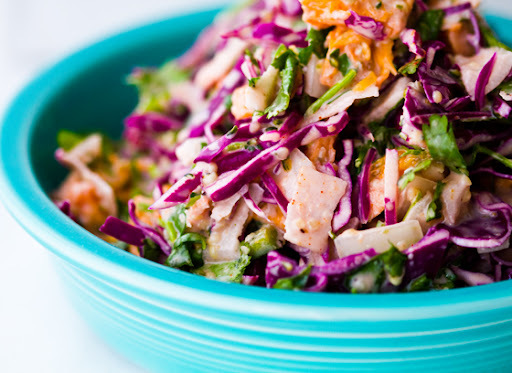 First off prepare the Fiesta Slaw according to the directions. (recipe) - Chill in fridge until ready to add to burgers. 2. Whip up your "special spicy sauce" - set aside in fridge as well. 3. Next up, prepare the burgers. Pulse all the ingredients in a food processor. You can also mash well by hand - but a fp is a tad faster. 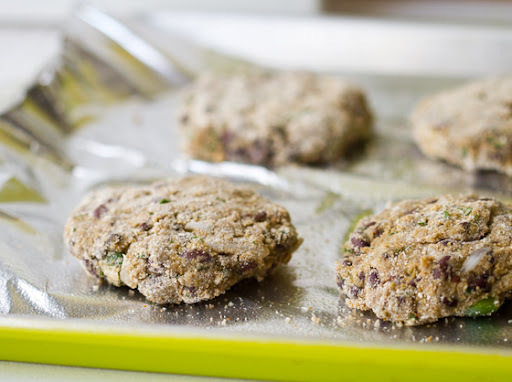 Next, hand-form burger patties with the mixture and place them on a lightly greased baking sheet. I like to roll my burgers in a touch of bread crumbs so that they have nice crisp edges. 4. Bake your burgers at 375 degrees for 30 minutes. Cool for a few minutes before assembling burgers. The last 5 minutes of cooking - add your burger buns to the oven to warm/toast them. burgers - this batch actually had no sweet potato in it - I later added the sweet potato and liked the moisture it added. Serve! Enjoy the fiesta in your mouth!